For the American modernist painter, see Andrew Dasburg. Dasburg is a municipality in the district of Bitburg-Prüm, in Rhineland-Palatinate, western Germany. Before Napoleon it was a part of Luxembourg. The Eifelkreis Bitburg-Prüm is a district in Rhineland-Palatinate, Germany. It is bounded by Luxembourg, Belgium and the districts of Euskirchen, Vulkaneifel, Bernkastel-Wittlich and Trier-Saarburg. Wikimedia Commons has media related to Dasburg . The European Figure Skating Championships is an annual figure skating competition in which figure skaters compete for the title of European champion. Medals are awarded in the disciplines of men's singles, women's singles, pair skating, and ice dance. The event is sanctioned by the International Skating Union (ISU), and is the sport's oldest competition. The first European Championships was held in 1891 in Hamburg, Germany and featured one segment, compulsory figures, with seven competitors, all men from Germany and Austria. It has been, other than four periods, held continuously since 1891, and has been sanctioned by the ISU since 1893. Women were allowed to compete for the first time in 1930, which is also the first time pairs skating was added to the competition. Ice dance was added in 1954. Only eligible skaters from ISU member countries in Europe can compete, and skaters must have reached at least the age of 15 before July 1 preceding the competition. ISU member countries can submit 1-3 skaters to compete in the European Championships. Kyllburg is a town in the Waldeifel region in the district of Bitburg-Prüm, in Rhineland-Palatinate, Germany. It is situated in the Eifel mountains, on the river Kyll, approx. 10 km north-east of Bitburg. The Netherlands national football team represents the Netherlands in international football. It is controlled by the Royal Netherlands Football Association (KNVB), the governing body for football in the Netherlands. The team is colloquially referred to as Het Nederlands Elftal and Oranje, after the House of Orange-Nassau. Like the country itself, the team is sometimes (also colloquially) referred to as Holland. David Olatukunbo Alaba is an Austrian professional footballer who plays for German club Bayern Munich and the Austria national team. He holds Austria's record as the youngest player to play for their senior national team, debuting for them in 2009 as a 17-year-old. Brexit is the withdrawal of the United Kingdom (UK) from the European Union (EU), that is legally scheduled to take place on 29 March 2019 at 11 pm UK time. There is an ongoing debate about leaving with a Withdrawal Agreement that has been ratified by both parties as an international treaty between the UK and EU or leaving with no such treaty. The EU has proposed that the date will be postponed to 12 April 2019 if the UK fails to ratify the Withdrawal Agreement, or to 22 May 2019 if the UK ratifies the Withdrawal Agreement, when the period for ratifying a Withdrawal Agreement will end unless a further extension is agreed. On 14 March 2019, the House of Commons voted by a majority of 211 votes for the Prime Minister, Theresa May, to ask the EU for such an extension of the period allowed for the negotiation. Brexit follows the referendum of 23 June 2016 when 51.9 per cent of voters chose to leave the EU. Withdrawal has been advocated by Eurosceptics, both left-wing and right-wing, while pro-Europeanists, who also span the political spectrum, have advocated continued membership. 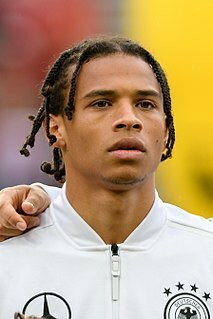 Leroy Aziz Sané is a German professional footballer who plays as a winger and as an attacking midfielder for Premier League club Manchester City and the German national team. Milo Murphy's Law is an American animated television series from the creators of Phineas and Ferb, Dan Povenmire and Jeff "Swampy" Marsh, which premiered on October 3, 2016, on Disney XD. The series revolves around the title character, Milo Murphy, who is a descendant of Edward A. Murphy Jr., the namesake of Murphy's Law, which states that anything that can go wrong will go wrong. It takes place in the same universe as Phineas and Ferb, with several references to the show occurring across season one, culminating in a crossover at the end of the season and leading into the second. Dark is a science fiction thriller web series co-created by Baran bo Odar and Jantje Friese. It is the first German-language Netflix original series and debuted on Netflix's streaming service on December 1, 2017. The first season received mostly positive reviews from critics. It has been compared to another Netflix series Stranger Things. A second season was approved by Netflix and production started in 2018. 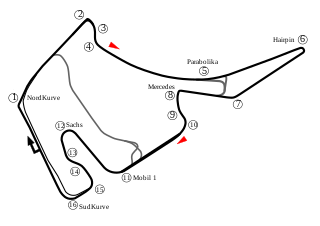 The 2018 German Grand Prix was a Formula One motor race held on 22 July 2018. After a one-year absence from the championship, the race returned to the Hockenheimring near Hockenheim in the German state of Baden-Württemberg. It was the eleventh round of the 2018 FIA Formula One World Championship, and it marked the 77th running of the German Grand Prix, and the 63rd time the race had been run as a round of the World Championship since the series' inception in 1950. The Eurovision Song Contest 2019 will be the 64th edition of the Eurovision Song Contest. The contest is scheduled to take place in Tel Aviv, Israel, following Israel's victory at the 2018 contest in Lisbon, Portugal, with the song "Toy", performed by Netta. The contest will be held at Expo Tel Aviv, the city's convention centre; the show will consist of two semi-finals on 14 and 16 May, and the final on 18 May 2019. The 2018–19 2. Bundesliga is the 45th season of the 2. Bundesliga. It began on 3 August 2018 and will conclude on 19 May 2019. The 2018–19 3. Liga is the eleventh season of the 3. Liga. It began on 27 July 2018 and will conclude on 18 May 2019. The 2018/2019 snooker season is an ongoing series of professional snooker tournaments being played between 10 May 2018and 20 May 2019. The season is made up of ranking tournaments, non-ranking tournaments and variant tournaments. In total, 46 events are to be competed in the 2018/19 season, beginning with the pro-am Vienna Snooker Open, and ending with the 2019 World Snooker Championship. The 2018–19 UEFA Champions League knockout phase began on 12 February and is scheduled to end on 1 June 2019 with the final at the Wanda Metropolitano in Madrid, Spain, to decide the champions of the 2018–19 UEFA Champions League. A total of 16 teams compete in the knockout phase. 101 Dalmatian Street is an animated children's television series produced by Passion Animation Studios and Atomic Cartoons. The series is loosely based on The Hundred and One Dalmatians novel by Dodie Smith and its film franchise by Walt Disney. It is the second TV series, following 101 Dalmatians: The Series, to be based on the franchise. The series is set almost sixty years after the original 1961 movie. This Bitburg-Prüm location article is a stub. You can help Wikipedia by expanding it.